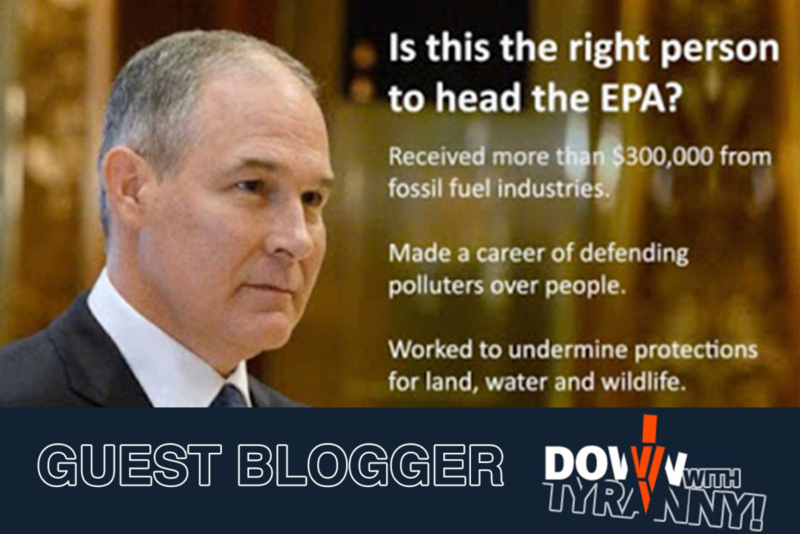 Normal Americans aren’t excited that Scott Pruitt is moving rapidly top destroy decades of progress at the EPA. But last week, the Christian Broadcasting Network, a right-wing outlet, looked at it from from the perspective of the lunatic fringe. We’re talking about a lunatic fringe that spits in Jesus’ face and worship mammon in the form of a fat self-glorifying orange orangutan. Forget Biblical injunctions like – Ezekial 34:2-4: “Son of man, prophesy against the shepherds of Israel; prophesy and say to them: ‘This is what the Sovereign LORD says: Woe to the shepherds of Israel who only take care of themselves! The fake Christians in Trump World are turning the Bible on its head to further their own of greed and avarice. No one is worse than Scott Pruitt, a full-fledged servant of the anti-Christ in the Oval Office. Read the entire blog at Down With Tyranny. Want to learn more about the rise and turn of the modern Evangelical Movement? Discover my new book Letter to Lucy: A Manifesto of Creative Redemption—In the Age of Trump, Fascism and Lies, a multi-touch book about art, love and parenting, from the fall of the Byzantine Empire to the prophetic music of Green Day and everything in between. Read the first chapter for free on your kindle fire or iOS device. Available now on iBooks and Amazon. May they and theirs be thoroughly consumed by their own heresies and hypocrisies . PS; And yes you do have a say where your 401k etc is invested regardless . So don’t take no for an answer . By law ,,, they have to comply with your wishes . Good Lord in heaven … looking over CBN’s website the article provided the link for … it felt like I’d entered into a christofascist Twilight Zone more resembling a christian wanna be Breitbart than anything even vaguely resembling anything Biblical or the truth . Ahhh .. but hey …. when did the likes of Pat Robertson ever care about the Bible … never mind .. the truth .